A T account is a graphic representation of a general ledger account. The name of the account is placed above the "T" (sometimes along with the account number). Debit entries are depicted to the left of the "T" and credits are shown to the right of the "T". The grand total balance for each "T" account appears at the bottom of the account. A number of T accounts are typically clustered together to show all of the accounts affected by an accounting transaction. The T account is a fundamental training tool in double entry accounting, showing how one side of an accounting transaction is reflected in another account. It is also quite useful for clarifying the more complex transactions. This approach is not used in single entry accounting, where only one account is impacted by each transaction. 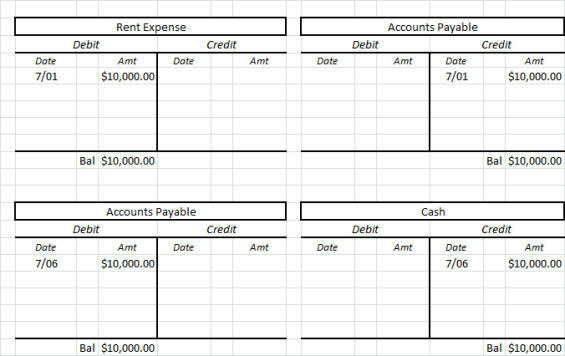 In the following example of how T accounts are used, a company receives a $10,000 invoice from its landlord for the July rent. The T account shows that there will be a debit of $10,000 to the rent expense account, as well as a corresponding $10,000 credit to the accounts payable account. This initial transaction shows that the company has incurred an expense as well as a liability to pay that expense. The bottom set of T accounts in the example show that, a few days later, the company pays the rent invoice. This results in the elimination of the accounts payable liability with a debit to that account, as well as a credit to the cash (asset) account, which decreases the balance in that account. To teach accounting, since it presents a clear representation of the flow of transactions through the accounts in which transactions are stored. To clarify more difficult accounting transactions, for the same reason. The T account concept is especially useful when compiling more difficult accounting transactions, where the accountant needs to see how a business transaction impacts all parts of the financial statements. By using a T account, one can keep from making erroneous entries in the accounting system. For day-to-day accounting transactions, T accounts are not used. Instead, the accountant creates journal entries in accounting software. Thus, T accounts are only a teaching and account visualization aid.